@Dovahboi : Just checked, and the downloaded package and files work for me. No issue loading the bots in the single player mode. Can you confirm the issue with a clean install and where you have extracted the package files to? Tig, I also noticed that loop_innertube.wav is missing for maps like dc_map19 & dc_map24. Also, my version of this mappack now has the patch on here built into it. Edited 23.73 hours after the original posting. @Colton: This is 100% an issue at your end. This is (again) how you test. 1) Remove everything from your quake3 directory, (including all sub directories) except for the Quake 3 engine and all the pak0.pk3 to pak8.pk3 files in baseq3. Just place everything a temp folder so you can move it all back. 2) You now have what is called a "clean install". Install just the lvl-dcpack.zip from this download. If you get this result: http://lvlworld.com/lvl/dc_map24b.jpg the problem is at your end. There is nothing else to discuss. I do not have ss_maps.pk3. I avoided it like the plague Tig, mainly because of the shader conflicts/errors. And also because of the many texture conflicts between that and the PC Q3. I fixed them all in my version of the mappack. There was supposed to be a shader that looked exactly like the one over on the blue side, but red for the red side on dc_map24, but it wasn't included in this pack. That shader name was supportctfred_rept, & trust me, it looks pretty cool. And it requires envmap_red.tga. Edited 32.25 minutes after the original posting. @Colton: Problem at your end and found. You have the Dreamcast "ss_maps.pk3" installed. There is a shader error in that PK3 which is throwing a texture in dc_map24. This "ss_maps.pk3" is NOT part of the download from ..::LvL, so as sst13 and I said, the issue is at your end. sst13, the missing texture issue actually exists because of a missing shader issue in dc_clientpak.shader, called supportctfred_rept. It's already fixed in my version of the mappack. I already extracted that texture out to a JPEG using the PVR viewer on Sega Retro, & included dc_map01 and the ss maps, including the ss_20x maps in my version of the mappack. All it needs now is the music for all the maps, which is also missing in this pack. http://soa.site.nfos...r/sound/ambience/ has one of the missing ambient sounds in this pack, named "loop_innertube.wav". EDIT: The loop_innertube.wav from Team Arena seems to be more relevant than the one linked here, but it's still linked for your convenience. EDIT2: Comparing the two, it seems that they're both the exact same, audio & all. Edited 3.87 days after the original posting. Tested the dc-mappack in a blank install. (quake3.exe + pak0.pk3...pak8.pk3 only) and found no missing textures in dc_map24. There is also no link in the dc_clientpak.shader or in any of the dc_map**.bsp files to envmap_red.tga. I guess there is some shader hijacking from another map on your end Colton. Edited 11.71 hours after the original posting. @Colton: Missing texture is at your end (or I have the wrong map). I'll remove this comment and yours as it is misleading soon. I'm noticing a small issue with this mappack. It's missing the envmap_red.tga texture. One map in this pack (one of the CTF maps, to be exact) has a missing texture issue because of it. Tig has been notified of this issue. Edited 3.06 days after the original posting. Technically all the maps are created by id software (save for a couple exclusives and the ss maps), and they were all reduced/tweaked/adjusted for the Dreamcast by Raster Productions who did the porting of the game. The dc_map01 was made by Id Software, Inc.
also dc_map01 has a lot of detail loss differences to get it to 30fps on the dreamcast, there's even a lack of a mirror. When the player fall down in dc_map19, he/she will teleported to spawn points. dc_map01 is (as far as I know) a straight copy of the intro level with crash from the original Q3A release. I think from memory this is why it was not included in this download. Why would anyone want to re-download something they already have? The DreamCast exclusive maps were very good, if not better than the stock Q3A maps. Hidden Fortress, while admittedly overplayed these days in QL, is still a great map with a genius layout and theme. Gaze of the Abyss is unique with it`s curvy architecture, making nade spam very effective. Blast Radius makes for fun small CTF games. Shame we don`t have the latter two on QL yet. @PaN61: When i type in console /sv_pure 0 it works! lol, check inside the q3tourney6.pk3 in the "maps" folder, if it has a .bsp and try typing in the console "/sv_pure 0" before typing "/map" or "/devmap and then the .bsp's name if there is one in the q3tourney.pk3. @lol: If you love the game so much, go and buy it. The maps you have listed are all official ones. They will never be part of a downloadable pack on ..::LvL. @PaN61: There are few Quake 3 default maps. wow 5 minuts ago I noticed that dc_map06 is also a ql map Oo I have played it in ql instagib. Shame that there isn't a rail in the dreamcast version. This is fun on tourney or 1vs1 instagib!! I think we don't have a new tourney map with this one. Don't know if they've changed item placement but it sounds like there wont be a tourney version. It's odd that they didn't add it into the Team Arena tourney maps with dc_map06, dc_map08, and dc_map17. ID made 'hidden fortress' or dc_map07 a quakelive map. I'm a big big fan of the Dreamcast version of Quake III, as people said it couldn't be done, and it's a fantastic conversion. Sure, there's some slight gameplay changes, but besides that, there are some absolutely superb maps in there, Abyss being one of my favs. PS2 maps I've seen look pretty cool too - will they ever see the light of day for PC though...? The Longest Yard looks awesome with the new skybox. It also seems to have better graphics. Too bad the best id map, Apocalypse Void, wasn`t in this DC pack. That would be a great skybox than just the pure black. So many maps, mods, etc are WAAAY better than the original game. It tells you something when thrid party programmers can make a better game than id software. RA3 anyone? Well, alot of the new maps are sweet, but about half of the maps are almost exactly the same as the original q3 version, only difference is terrible lighting (look at their version of dm6 - lol). version's maps since it's offline only. Perhaps they'll be released though...we can only wait and see. The Q3 remake lvls seem to have some of the fun taken out, as well as the lightmaps. But the DC original lvls are pretty cool. save when you hit the fog, there goes one of my favorite strategies. Too bad I gotta downgrade Q3 to whup on the DC people online. 7 points for 1 buttload of maps. who has make these map from DC to PC? spog's 'hidden fortress' is reason alone to d/l this. Great to be able to try this DC version, since I,ve never seen any DC game. After playing well over 500 q3.pk3's it's fab to check out the old originals with a slight difference. Let's hope in a few months we can get our itchy hands on a version of ps2's. Blah, ignore me, ignore me... I found it. (map 7) And "Hidden Fortress" is the correct name BTW. I remember my favorite map from DC Q3 being "Lost Fortress" (I think that was the name) and on a quick look through these maps I don't see it. Bit of a shame. If I'm not mistaken about that... then, any info on what was omitted and why? Yummy! Over all, very nice. 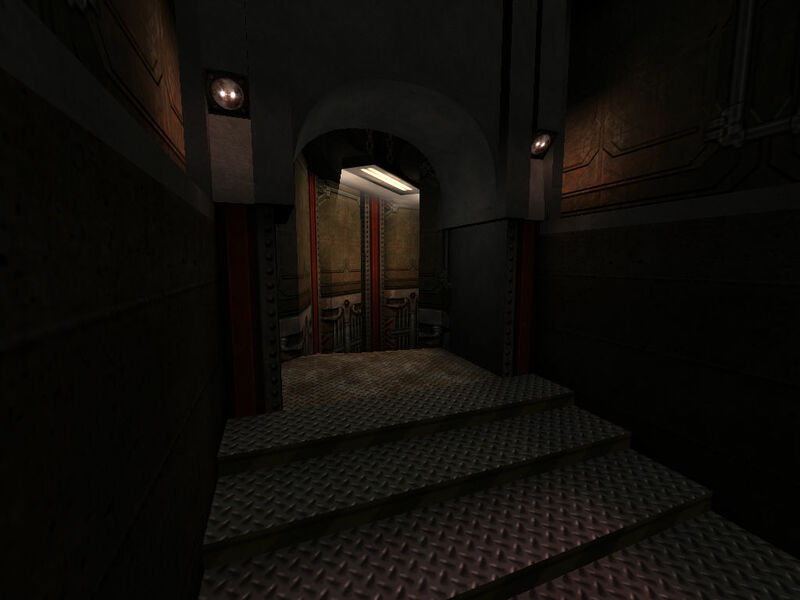 In most of the Dreamcast only maps, there was an abundance of curvy stairwells and interesting textures to attract the eye. Assuming these are unaltered from the Dreamcast versions, I am impressed. I expected the texture's resolutions to maybe be a little low, since I run q3 at 1024x768 (as I imagine many people do). Stupid me, I can't remember numbers, but I really liked the Abyss map. The Dreamcast logo even snuck in their for some pimping, though since I don't own a Dreamcast yet, there's not much chance of my buying one at this point. ajay: As a "PC-Only" person, I enjoyed the pack thoroughly. The exclusive new maps were certainly well done, though mostly not quite the calibre of Q3's default maps. Then again, there were 2 or 3 that were very impressive! There were also some that you'd have if you'd bought the PC's Team Arena, though I believe they feature some Team Arena weapons in that version. The converted q3 maps were not so consistent (which is saying something, lol). Some had very nice changes in them, and almost all made a few size alterations that I agreed with. In many maps halls were widened or shrunk down to size, rounding out the weapons usage more. The conversion of Q3Dm3: The Arena of Death, was probably my favorite. The Grenadelauncher area is one of the best examples of hall widening. It is now not deadly to go down there and grab the gl, because you're not as likely to fall victim to spam. I loved the addition of the quad; that level has always screamed for something in the middle of that floor, and the powerup did the trick nicely. I too liked the vortex portals for when you fall off the edge of space maps. I never fell off on The Bouncy Map (q3dm18) conversion, so I don't know if only The Longest Yard (q3dm17) had this effect but either way it was cool. It adds a different strategy that you have to get used to, however, which is jumping off when you are about to die so that you can teleport away. The bots of course don't understand this and can't make any real use of it. The last group of conversions were really aesthetic; q3dm6 (the camping grounds) is a prime example. Some lights were added on the middle floor, which were pretty, but not much else changed. 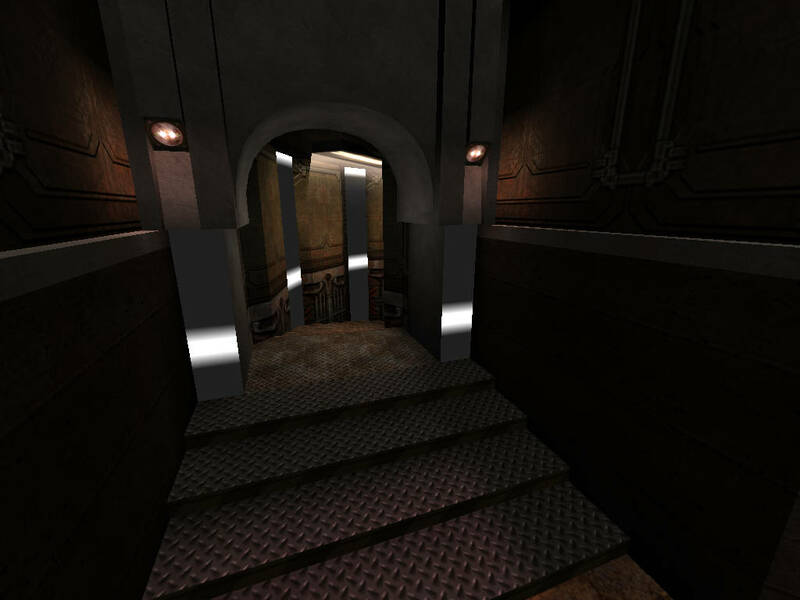 Some other maps had textures and/or brush count reduced to make them playable on the Dreamcast, such as the q3dm7 (Temple of Retribution) conversion. Nice boost on the framerates ( I really liked the "new" q3dm17), but otherwise a bit pointless-to me, I should add. A few sound hiccups too. Ill give it a 6.
theres nothing stopping you from playing these with the newest pr. I've also played the DC version of Q3, online as well. This is a great map pack, consisting of maps that provide great dueling matches. Personally, I wouldn't play these maps versus the DC crowd. There not that bad at Q3, but since the protol there is at 1.16, there are a lot of PC ppl that just love and cant stand not to cheat. Auto-aim, etc., you name it. (Considering that its easy to get those old 1.16 cheats). Another issue is that of the framerate; most PC ppl will enjoy a considerably better framerate when playing versus Dreamcast, since it maxes out at 50 something frames (and can bog down to the 30's in some 4 player matches). The only PC players that will be playing vs. the DC crowd are those that lack any real skill; taking advantage of all the items I outlined above, in my opinion. As someone's who played the dreamcast version almost as much as the pc version; I was really looking forward to this release. One thing I was interested in was whether or not the space maps would keep their no-risk teleporting back to safety feature, they do and the effect is just as cool as the dc version. Btw what do pc-only ppl think of this?